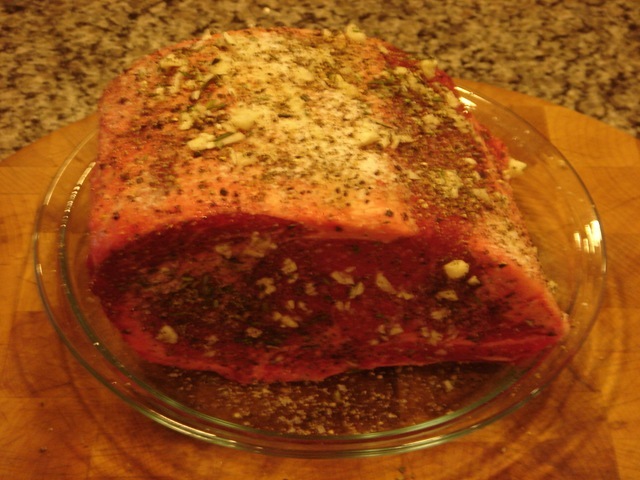 First brush the roast with olive oil, then apply seasoning on all sides. 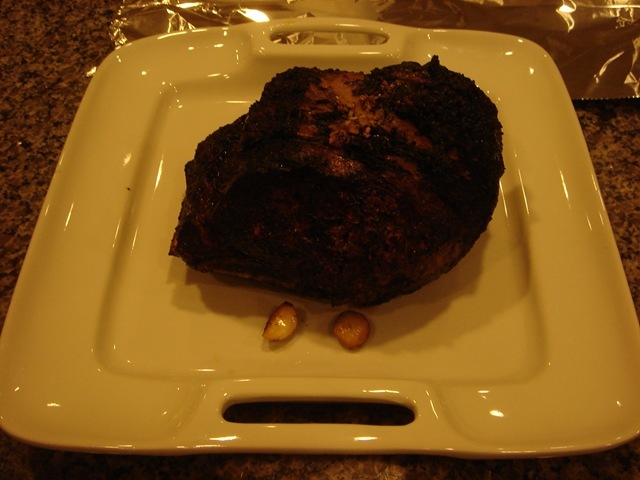 Start by searing the roast at 600 degrees for 3-4 minutes on each side. 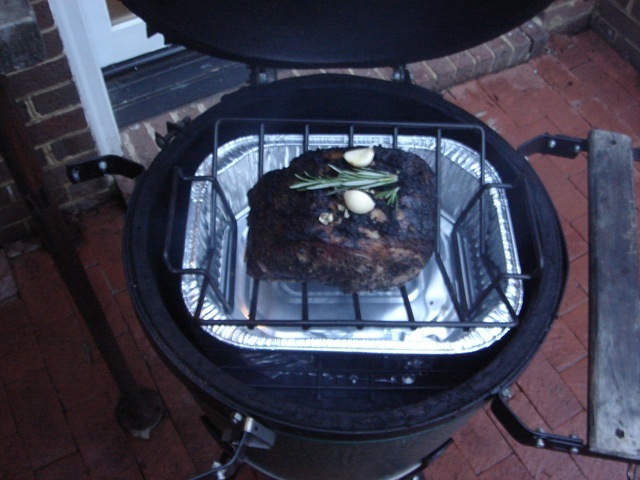 After searing, pull the roast off and allow the BGE to cool down to 325 degrees. Put the roast back on the BGE, setup for indirect cooking, on a roast rack with a pan under it to catch the drippings and protect the roast from direct heat. 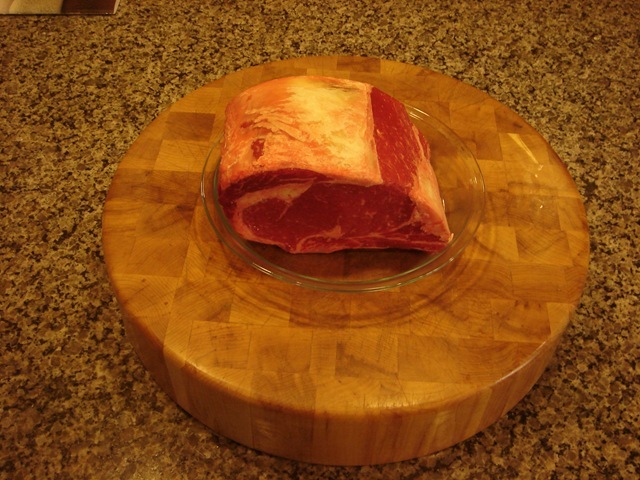 Cook until the internal temperature reaches 130 degrees, for medium to medium rare. It took about 2 hours. Then pull the roast off and let is sit for about 20 minuets, covered in foil, before carving. This is what it looked like on the plate. Hope you have as much luck as I did. Enjoy. For the love of all beef that is prime, sear for only two to three minutes per side unless you want an over-charred outside. Also, substitute yellow or spicy brown mustard for the olive oil to act as a binder for the seasoning. Keystone – I agree on the less time searing, I will change the post. But I think I will stick with the olive oil and leave the mustard for my ribs. Thanks for the help. I’m trying your way this right now:) First time egg owner and prime rib cooker on the grill. Are you sure it was 2 hours for 4.5 pounds I saw another green egg video andit was 2 hours for 7.5 pounds ? I am using this method right this second. I will post back with my results. The author has some great tips and I like the way he uses scientific facts to make for interesting reading. He explains reverse searing. Basically that is is best to sear at the end. I’ve followed his instructions for ribs and they were by far the besr ribs I’ve ever tasted. I’m hoping this recipe will be as successful. 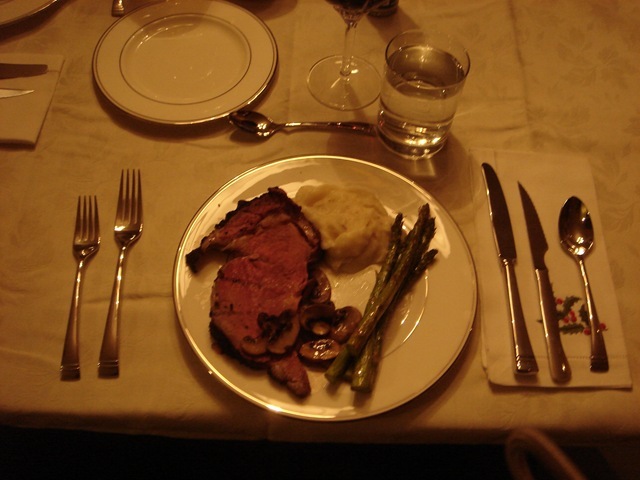 How long for an 11 pounder bone in prime rib? I do agree with all of the concepts you have introduced for your post. They’re very convincing and will definitely work. Still, the posts are too short for beginners. Could you please prolong them a bit from subsequent time? Thank you for the post. Excellent post, thanks for taking the time Drednaught. 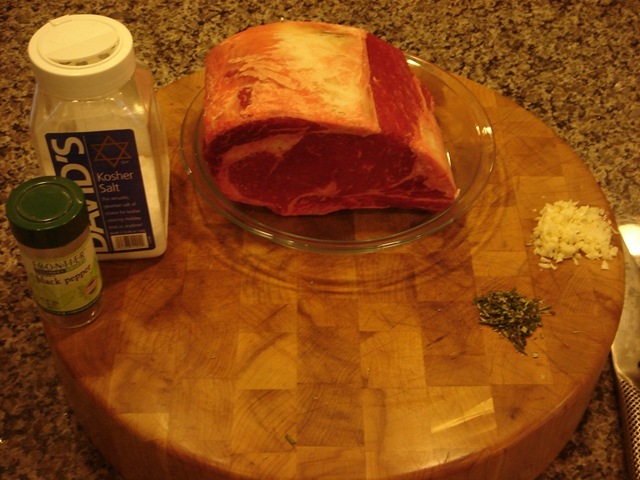 I too used olive oil for prepping my 5 lb bone in rib roast today. In addition I seasoned with sea salt , ground pepper and garlic powder. I took some pieces of oak bark and let them soak in a couple ounces of single malt scotch which I then added to the coals. 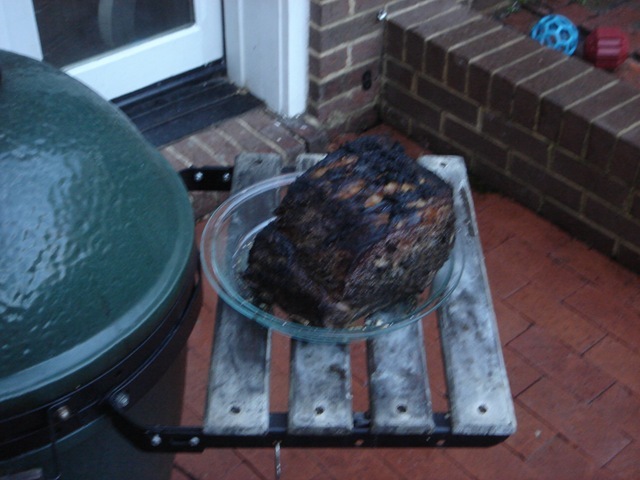 I followed the advice of another BGE’er and braised for only 2 min a side at 500 degrees. Then with the rib roast in a rack with foil underneath to catch drippings, I eased the temp down to 300 degrees and let cook for an hour and forty five min until internal temp was 130-140 degrees. 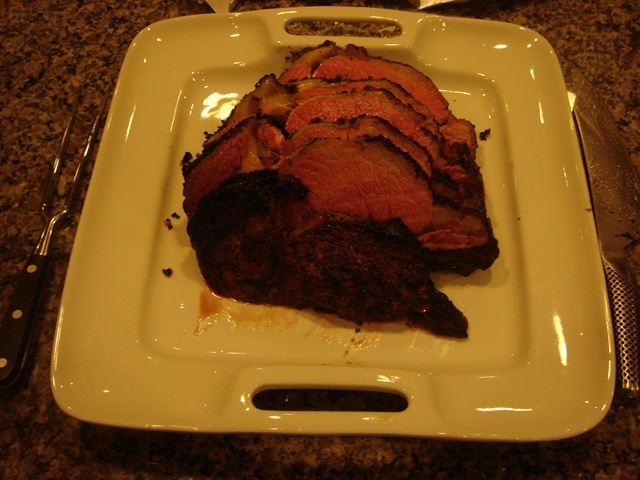 Cover in foil and let sit at room temp for about 15-20 min for a medium to medium rare finish. Absolutely out of this world flavor. Good luck my friends and Merry Christmas. I too am an aspiring blog blogger but I’m still new to everything. Do you have any points for newbie blog writers? I’d certainly appreciate it.